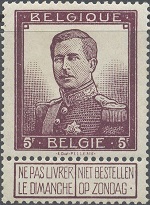 Belgium stamps with the portrait of King Albert I first appeared in 1912. 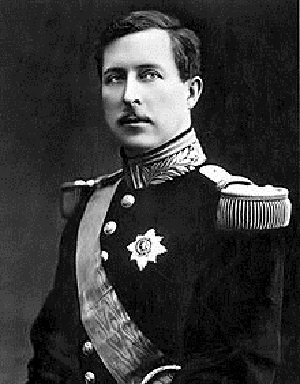 Albert actually ascended to the throne in December 1909, but the new stamps with his portrait had not yet been designed, and the new plates were not ready for production until 1912. The eleven new stamps shown above were all issued in 1912, and they are all perforated 14. 1 C. (1912 - Scott #92) - Orange. 2 C. (1912 - Scott #93) - Orange Brown. 5 C. (1912 - Scott #94) - Green. 10 C. (1912 - Scott #95) - Red. 20 C. (1912 - Scott #96) - Olive Green, Bronze Green. 35 C. (1912 - Scott #97) - Bister Brown. 40 C. (1912 - Scott #98) - Green. 50 C. (1912 - Scott #99) - Gray. 1 F. (1912 - Scott #100) - Orange. 2 F. (1912 - Scott #101) - Violet. 5 F. (1900 - Scott #102) - Plum. The four re-designed stamps shown above were issued between 1912 and 1913. These new designs have a larger head than the previous issues. 10 C. (1912 - Scott #103) - Red. 20 C. (1913 - Scott #104) - Olive Green. 25 C. (1912 - Scott #105) - Ultramarine. 40 C. (1913 - Scott #107) - Green. Earlier printings have the engraver's name below the design. Later printings, except for the 40 C. denomination, are missing the engraver's name below the design. These were the LAST BELGIUM STAMPS to have the perforated Sunday delivery label at the bottom. The eight new definitive-type stamps shown above were issued between 1915 and 1920. They are all typographed and perforated 14. 1 C. (1915 - Scott #108) - Orange. 2 C. (1915 - Scott #109) - Chocolate. 3 C. (1920 - Scott #110) - Gray. 5 C. (1915 - Scott #111) - Green. 10 C. (1915 - Scott #112) - Carmine. 20 C. (1915 - Scott #114) - Red Violet. 25 C. (1915 - Scott #115) - Blue. The seven pictorial definitive Belgium stamps shown above were all issued in 1915. The stamps are engraved, and they come in two different gauges, perforated 14 and perforated 15. The perforated 15 stamps are the higher priced of the two gauges. 35 C. (Scott #116) - Cloth Hall of Ypres. 40 C. (Scott #117) - Bridge at Dinant. 50 C. (Scott #118) - Library of Louvain. 1 F. (Scott #119) - Scheldt River at Antwerp. 2 F. (Scott #120) - Anti-Slavery Campaign in the Congo. 5 F. (Scott #121) - King Albert I at Furnes. 10 F. (Scott #122) - Kings of Belgium - Leopold I, Albert I, Leopold II. Due to the German invasion and occupation of Belgium during World War I, no Belgian stamps at all were produced between 1916 and 1918.